Adorable Retro Halloween Girl Image! 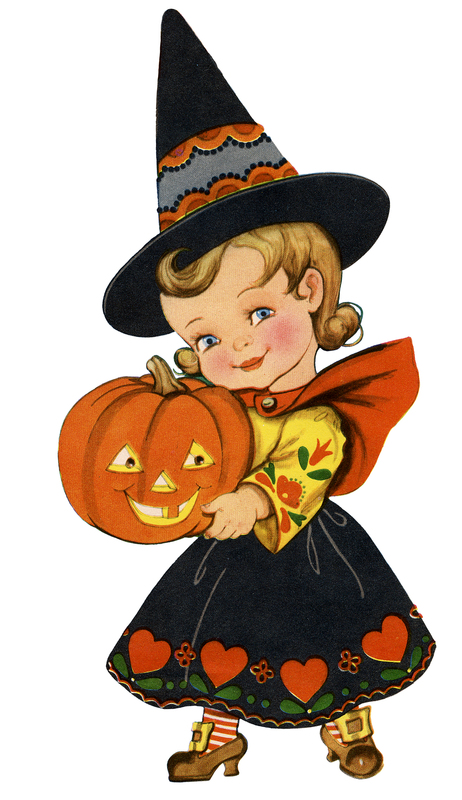 Today I’m sharing this Adorable Retro Halloween Girl Image! Isn’t she the cutest?! Featured above is a sweet little girl wearing a Witch Costume and holding a happy looking Jack-O-Lantern Pumpkin. I love the little Pennsylvania Dutch designs on her costume. This one was scanned from a 1951 Coloring Book cover. So nice to use in your Halloween Designs, Crafts or Collage Projects! Happy Halloween Cute Girl Holding Pumpkin Postcard! Halloween Cat Image – Driving a Pumpkin Coach – Amazing ! Cutest Vintage Witch Costume Halloween Postcard! It’s almost Halloween but today’s newsletter was like Christmas to me! The images were so cute! I loved them all but the Halloween girl and the little Dutch girl were just adorable! I absolutely adore this image! She’s beautiful and so colourful! Thank you so very much! I know, so adorable! Happy Halloween Irene!